Random.org picked the winner for the Holiday Hop giveaway, and it's time to announce who that is. PLUS (assuming the winner has a device that supports a .mobi file) an e-copy of my grammar guide, There, Their, They're: A No-Tears Guide to Grammar from the Word Nerd. The e-version is more comprehensive and up-to-date than the print version, so booyah. Congratulations to Ruth, and thanks to everyone who entered! I'll be back to regular posting after the new year. Now, off for more pie . . .
Yippee for book giveaways, and an extra hooray for ones that coincide with Christmas! 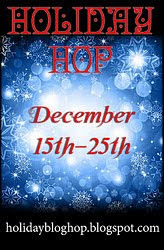 I'm part of the Holiday Blog Hop, which runs from December 15 - December 25. Visit The Holiday Blog Hop to find the rest of the participating blogs (and so you can win more ebooks!). SO: Enter any of the giveaways participating, including mine, and if you win, you'll have an extra shot at the grand prize. Due to personal writing and editing deadlines (and thing like, oh, family and Christmas), this will be my last post until after the hop is over and I announce the winner. Note: The 3 novels are available in formats other than .mobi (Kindle), but to date, the grammar book is only in .mobi. Apologies if the winner doesn't use Kindle; they'll miss out on that book. As I did during my last giveaway, I'm not going to make people jump through lots of hoops. I like doing giveaways to thank my followers. 1) Be a follower (either on my blog through Google Friend Connect) or on Twitter. 2) Leave a comment on this post telling me that you're a follower (and which way). Entrants must be 18 years old, and I must be able to contact the winner, either via an email address left in a comment, or via a Blogger profile link. If the winner does not contact me to claim their prize within 48 hours, it's forfeit. The other day, a dear friend of mine, Michelle, who is one of the powerhouses behind Mormon Woman, pointed me toward a beautiful song for Christmas. For more information, visit (and LIKE!) the Shawna Edwards Facebook page. To leave your Christmas memory or tell how you'll be Christ into Christmas, here's the Shawna Edwards website. It's beautiful. I think I'll go play it again.